Alexis is a retired physician who loves breaking glass. In 2011, after taking a glass fusion class with the glass artist Yvonne Yaar, the craft became her passion. Learning from various artists in glass art studios in New Jersey and Florida, she continued to explore this wonderful art media. The colors and textures of glass are fascinating and excite her creativity. The glass fusion process allows the glass to find it's own path or way. The artist just provides basic structure. 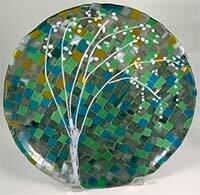 Fused glass is glass that has been heat-processed in a kiln at a range of high temperatures. There are 3 main distinctions for temperature application and the resulting effect on the glass. Firing in the lower ranges of these temperatures is called "slumping". Firing in the middle ranges of these temperatures is considered "tack fusing". Firing the glass at the higher spectrum of this range is a "full fuse". All of these techniques can be applied to one glass piece in separate firings to add depth, texture and shape.